Wayland Dean was one of those tragic stories that pepper baseball history. He was deeply troubled; a chronic alcoholic that suffered from depression. But he had a live fastball and made his way up to the majors in 1924 with the New York Giants. The Giants under John McGraw were known to take chances on troubled players. McGraw didn’t care what his players did off the field, only on it. Unfortunately for Dean, he could never harness his fastball. He was as wild on the mound as he was in the speakeasies at night. He did pitch for the Giants in the 1924 World Series (a loss to the Senators), and won ten games in 1925, but they could no longer tolerate his off the field antics, and sent him packing to the Phillies in 1926. It didn’t take the Phillies long to figure out what they had, and they sent him to the Cubs in 1927. When Dean arrived in Chicago, he told the team he had a sore arm. He pitched in a total of two games for the team (2 IP, 2BB, 2K, 0.00ERA), before disappearing during a trip to New York. 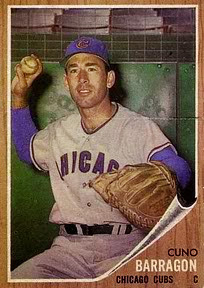 He went on a drinking binge, was released by the Cubs, and was dead three years later at the age of 28. Gregg was signed as a free agent by the Cubs in two different seasons to help stablize the back end of the bullpen. In 2009 he was brought in to replace Kerry Wood, and in 2013 he was brought in to replace Carlos Marmol. And though he saved 56 games for the Cubs in those two seasons, and his numbers were respectable, he isn’t remembered by Cub fans as a great closer. Those 19 homers he gave up always seemed to happen at the worst possible times. Bako was the backup catcher for the Cubs during their division winning 2003 season. In the NLCS that year he got quite a bit of playing time thanks to his lefthanded bat, and hit .250 in 17 plate appearances. He also caught for the Tigers, Astros, Marlins, Braves, Brewers, Dodgers, Royals, Orioles, Reds and Phillies in his twelve year big league career. Varsho came up through the Cubs system and got limited playing time as a backup outfielder in parts of three seasons. He had a little more success with his next team, the Pittsburgh Pirates, and hit his first career homer for them against the Cubs in Wrigley Field. After his playing days, he went into coaching and was very briefly (two games), the interim manager of the Pittsburgh Pirates. He’s currently working for the Angels. Newman was a big righthander (6’5″) who pitched for the Cubs in 1971. He got into thirty games and pitched respectably (3.52 ERA), but is remembered more for the way he got to work every day. He rode his bike. Leo Durocher thought he was nuts, but put up with it until Newman got into a bike accident on a day he supposed to pitch. He was shipped off to Milwaukee before the 1972 season. Art’s heritage was German, so of course his teammates called him Dutch. He was mainly a pinch hitter and backup first baseman/outfielder in his five year big league career, the last two of which were with the Cubs. 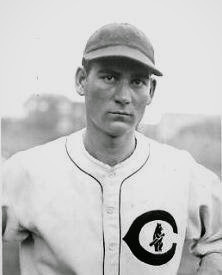 He also played with the Senators, Yankees, and Reds. His real name was Zerah Zequiel Hagerman, but his Cubs teammates opted to reject that mouthful and call him Rip. Rip pitched very well for the Cubs during his only year in Chicago. His 1.82 ERA in 79 innings pitched were a real help to the team that year. He later pitched for Cleveland with less success. He was only 43 years old when he died in 1930.